Putting the three branches into historical context is important for understanding them, but equally important is illuminating the testing ground for their formation and solidification as current rules and regulations. Governments are fluid entities, and even written documents can be amended and changed out of careful consideration, observation, and sometimes necessity. 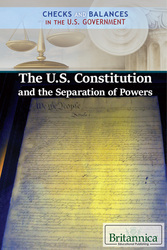 More closely than the rest of the books in this series, this text shines a light on previous, documented changes to the written record underpinning the U.S. government, the U.S. Constitution, and how they came to be made.